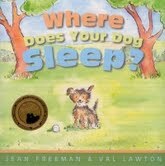 In Where Does Your Dog Sleep?, written by Jean Freeman and illustrated by Val Lawton, two boys are sitting chatting when a dog passes by and one boy asks the other where his dog sleeps. He then asks if the dog sleeps in some pretty strange places. There is a twist at the end of the book when the boy discovers that the dog he thought belonged to his friend doesn't belong to him at all. There are a lot of repeated words and phrases that make the book good for shared reading. Anna really enjoyed the book, partly because she enjoys anything that is about dogs but also because she got a kick out of the suggestions as to where a dog might sleep. I found a great YouTube video of Where Does Your Dog Sleep? featuring the author narrating the story.